Long-time gymnastics coach Phil Savage appreciates the similarities between his sport and diving. "You're flipping. You're twisting. The big difference is we in gymnastics land on our feet. They land hands first." KNOXVILLE, Tenn. — He retired last summer for about a month. Now, Phil Savage is diving into a new coaching role. He helps University of Tennessee divers with stretches, strength, and form. "I love being here," he said. His real expertise is gymnastics. Phil Savage is a legend. For decades he's coached championship gymnasts, he's a four-time Hall-of-Famer, and he's even earned USA Gymnastics highest honor, the Frank Cumiskey Award. "It's very similar. You're flipping. You're twisting. The big difference is we in gymnastics land on our feet. They land hands first," he said. Phil and his wife Lisa are longtime friends with UT's head diving coach Dave Parrington. "I came in here one day in August just to hang out. And he just leaned over and he goes, hey, I need an assistant coach. Do you want to be an assistant? And I said sure, ok. He said you're hired," he said. "I come in just completely volunteer on a volunteer basis and add my little mojo to these guys." 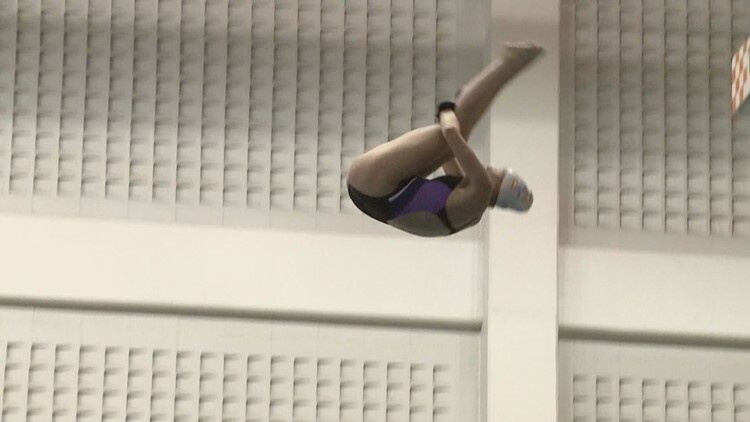 University of Tennessee Head Diving Coach Dave Parrington said, "There are a lot of similarities in terms of what we are doing in the air: somersaulting, flipping, and that type of thing. There are some mechanical differences. But Phil is such a student of movement and that type of thing that I knew he would be an incredible addition to our staff." That's high praise from Dave who has coached for about 30 years at UT, where he has a diving scholarship named for him. He's lead many men and women to SEC and national championships. He's coached teams in international competitions including the Olympics. And he values Phil's input. "He's learning more about the actual sport of diving now, some of the subtle differences that we have between the sports. He goes home at night and studies all the videos and pictures that he takes and comes back with new ideas almost every day," Dave said. Phil said, "These divers when they are doing all these flips I get it. I get it. The entry part? How to get to their perfect entry part they call it ripping it, the perfect rip. A lot of it I'm finding out happens underwater which is mind-blowing." Even as the divers work toward the SEC Championships next week, Phil looks forward to the off-season to ramp up training. "I would love to stay as long as he wants me. Honestly, as long as Dave thinks I'm OK I'll come in and put my two cents in," he said. Dave said, "Phil has boundless energy. And incredible positivity. One of the most positive individuals I've ever met." Phil Savage is making a splash at UT. He is not only a diving coach but also a professional photographer and a grandfather.